New Page Books, 9781564145888, 304pp. Originally published in 1984, this is a classic in its field. Not only is it the first book to promote reading the cards for your own insight, but it also shows you exactly how to do so. It revolutionizes learning Tarot through a combined emphasis on self-teaching techniques and personal insight. Never before has a Tarot book so comprehensively linked the many areas of New Age thought. You will find journal writing, mythology, psychology, self-help, relationships, prosperity and right livelihood, crystals, channeling, astrology, numerology, poetry, art, and occult metaphysics--all explored and integrated with the Tarot. Expanded interpretations for the Minor Arcana. Reversed card meanings for all 78 cards. An entirely new history-based appendix on the latest research and discoveries. Information on your Shadow/Teacher cards. Tarot for Your Self uses meditations, rituals, spreads, mandalas, visualizations, dialogues, charts, affirmations, and other activities to help you establish your own relationship with the cards. All the information is presented using the best in traditional knowledge and know-how. This powerful breakthrough process will turn all your readings into truly transformative experiences. 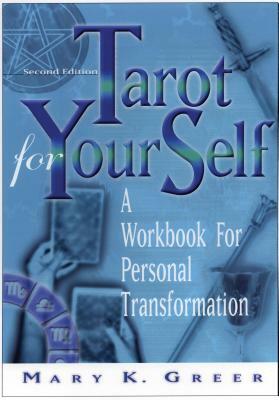 Mary K. Greer is the author of five books on the Tarot, including Tarot Mirrors. A student of Tarot for 34 years, Mary is a Tarot Grandmaster and an Arch Priestess in the Fellowship of Isis. She is featured at Tarot conferences and symposia around the world, is active in Internet discussion groups, and directs Tools and Rites of Transformation (TAROT), an educational center for the study of divination, women's mysteries, and the transformative arts.